When you are organising an event, the manner in which you serve the food is equally important to the actual food you serve. These days, there are countless possibilities. From spectacular live cookings to traditional service at the table. Your choice of set-up depends on the type of event, the timing, the location and of course the budget. Ideal for formal events such as galas or benefits. This is also the perfect formula for official speeches or presentations. The guests sit relatively still at the table and focus their attention on the speaker. You select this set-up if you want your guests to be able to have deeper conversations with each other and network on a smaller scale. A drawback is that you can only offer your guests a limited menu choice. You had also better select a sufficiently spacious location. Nothing can ruin a dinner like being packed like sardines in an overcrowded and hot hall. You do, however, need some space to put the tables and to give the waiters some room to move around. Also bear in mind that this is often the most expensive formula. For bigger events on which guests arrive at different times, a buffet is the best formula. Other advantages are that you can offer a larger variety of dishes and that your guests choose themselves, in accordance with their diet: vegetarian, gluten-free, low-fat... An important item is the service: make sure the queues don't become too long. Ensure that there are sufficient buffet tables where your guests can line up along two sides. In order to improve the network, you had best provide various eating spaces: a couple of tables with chairs, combined with high chairs and several cozy lounge corners. This formula offers two advantages. Your guests don't have to move in order to retrieve their food. They can calmly talk on while the waiters bring them their food. And you can perfectly manage your budget, because you can decide the amount of food. Depending on the timing of your event, you can provide food which fills your guests up. After all, you don't want your guests to go home hungry. Also make sure that they can easily eat their food with one hand (only a fork or a spoon). This is the perfect formula if your participants want to network to the fullest. The nicest set-up for an event in a loose atmosphere, Depending on the number of participants, you can provide several stands with live cooking. An additional advantage is that cooks can directly supply the culinary wishes or special diets of customers. Your guests themselves can see how their food is prepared. This is already a dish in itself and it also offers conversation material. Ambiance ensured! If you apply this set-up to a network event, make sure there are also some seats and high tables at which people can easily eat. THE hype of the moment. On events and festivals it's hard to miss them. Besides the traditional fastfood and pastry stands, nowadays there are also mobile soup stands, quiche stands, sushi stands, oyster stands, exotic stands, ... You name it. Almost every self-respecting caterer with a little bit of fame has his own food truck nowadays. Ideal for both big and small events. 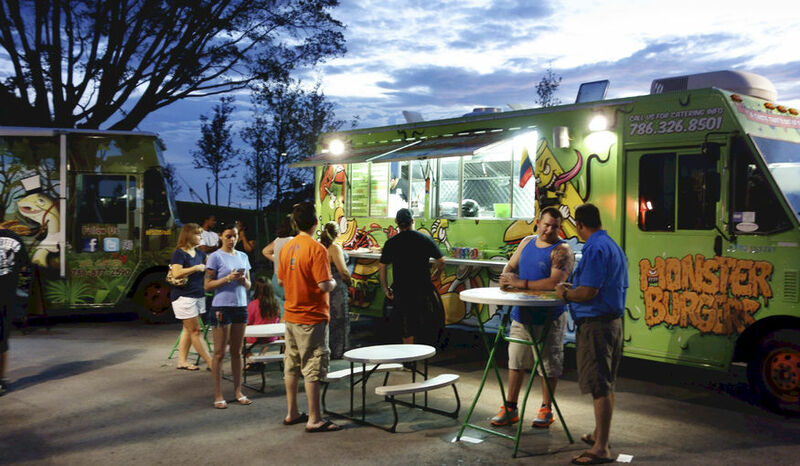 From family parties to big festivals; a food truck always fits. The choice is extensive and the quality is most often high. The food is prepared fresh and where the guests can see it. A bit like live cooking. A drawback is sometimes that the guests need to move over to the truck, which is most often parked outside. Keep that in mind when you choose a location. You had best not park the truck too far from the 'party area'.